Like myself, Yahiya Emeric is a convert to Islam. He embraced the religion in 1989 and have written several books including The Complete Idiots Guide to Understanding Islam. You can read more about his life and published books on Wikipedia. This is the very first book that I read about Islam. This book had a great impact on my life and was one of the stepping stones to My Journey to Islam. You will find the book very easy to read and simple to understand. If you are seeking to find out more about the religion or are new to Islam or just starting your journey in Islam, this book is for you. These are just a few of the topics covered in the book there are many more. With so many people converting to Islam the book helps to address misconceptions and misunderstandings. It explains what Islam upholds and disallows, It also gives a clear overview of the Islamic way of life. The book is very good at highlighting the need for the public to comprehend their Muslim neighbors and their religious way of life as well as their culture. Just the Facts - This nutshell of information confronts myths, stereotypes, and misunderstandings about Islam. I really struggled to believe this at first, but then I remembered as a Christian all the miracles I had believed in. The Prophet Jesus was blessed with many miracles and I believed in every one of them. As a Muslim we have to believe in all the Prophets, Adam, Isa (Jesus), Nuh (Noah) Muhammad (saw) and many more. Besides this miracle of Muhammad's Night Journey, he was given the most valuable and precious miracle of all the Prophets, The Quran. In this book, you will also find a whole chapter on Mecca. The chapter explains why Muslims make the pilgrimage to Mecca and all the rituals involved. When I first read this book in 2004 I never envisaged I would ever travel to Mecca but I was blessed and have since traveled to Mecca. I made My Umrah Journey during the blessed month of Ramadan in 2017. 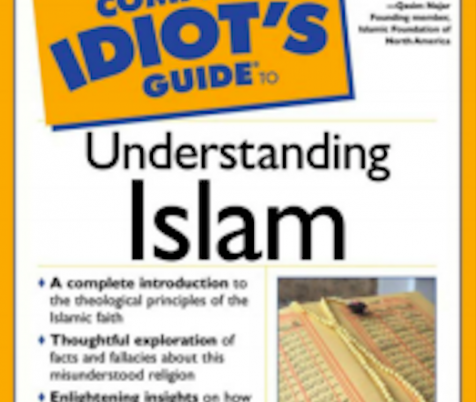 The Complete Idiots Guide to Understanding Islam is an exceptional book for anyone who does not know anything about Islam. I have given this book to non-Muslims as a gift and to those seeking to know more about the religion. The book covers more than just the basics of Islam which you will find in most books on this topic. This book goes further, investigating deeper issues giving you a true perspective of the religion. This book will make you think and question for yourself the true aspects of the religion, it will also remove a lot of myths and misconceptions conveyed by the media. Wsalaam, this is exactly why I did the book review as I was a non-Muslim when I first read it 14 years ago, and I still recommend or give it as a gift because it addresses a lot of the propaganda and stereotypes which opened my eyes about Islam. I use to think Muslim women had no life, that they had to walk behind their husbands, which of course is all rubbish. The title of there books does not bother me personally. Before reading this book I read the idiots guide to Judaism, and also dummies guide to building a website. It’s simply saying if you read this book you will find it simple to read. I also think it also comes down to intention. If someone truly wants to understand Islam the title won’t matter. Thank you for your book review. I think every child should read about every religion in the world. Perhaps then, we could understand each other better and respect each other’s faith in a more meaningful way. I think believers of all religions carry around a lot of misconceptions about other religions. This leads to a lot of conflicts which are probably down to ignorance. Books like the one you’ve reviewed are excellent, so thank you. Yes, I am with you on this one. I have always had a fascination for religion. I took Religious Education at school as one of my Subjects and later on studied world religion. I also homeschooled my Son for a few years and taught him about the different religions. We are all different it’s the way God made us, different in colour, beliefs, religion, culture, and free will – I embrace these differences its a brilliant way to learn, and I love learning. Thank-you for this excellent overview! I have studied Islam in some depth, and this sounds like an excellent resource for people who don’t understand Islam. I love the stress on modesty and chastity. It’s a great overview of the basic principles. Does it cover the varieties of Islam? There are many denominations; each with their own approach to the practice. What about fatwa’s? Hello Shelia thanks for your comments. Yeah the book is a great overview of the many aspects of Islam. There is a whole chapter dedicated to different sects (varieties). The author talks about the history, how the sects began, their differences and beliefs and then discusses the two main sects the Sunni and Shi’as. The book does not really cover fatwas. It mainly focuses on the laws from the Quran and Sunnah. I really really like Yahiya Emerick! I have his book on the meaning of the Holy Qur’an for school children and love how it is presented – it doesn’t surprise me at all that you love this piece of his work too! He is really good at getting the essence of Islam across masha’Allah – may Allah preserve him. This is so insightful as it’s lovely to hear another perspective and even more so a simple book to help new Muslims or non-Muslims to understand Islam a little more! SubhanAllah, I like the sound of this book and the samples you shared. Also, I had never thought to research whether Yahiya Emerick is a convert or raised in Islam. Jazakiillahkhayr. Yes, this book is great for Muslims and non-Muslims. I read this book when I was a non-Muslim, very easy to understand and digest and recommend to any non-Muslim that wants to know more about and understand Islam. Hey Jamila, love your name. It means “beautiful” in Islam, right? I’m Filipino and a Christian, but I am currently based in an Islamic country so majority of my co-workers and the people I interact with are Muslims. Although there are Muslims in the Philippines, I find Muslims here a bit different. How so? Well, first of all, all women have to cover themselves and some even cover their faces, only exposing their eyes. During my first year here, I tried to learn as much as I can about Islam, their culture and their beliefs so I will know exactly how to deal with them. I’ve been searching for relevant books to read but haven’t come across this book. The complete idiot’s guide to understanding Islam seems like a good book to read for anyone who wants to know what Islam is all about. I hope to get my hands on this as I really want to know what makes Islam different from the other world religions. By the way, I always hear Muslims say that Islam is a religion of peace. But after being in the Middle East for more than 5 years and having witnessed the war that has been going on between the Islamic groups Shiite and Sunii, the bombings and all that, I am left wondering why there is no peace here when these countries are predominantly Muslim. I tried asking my superiors who are Muslims this question but somehow they always find a way to avoid this kind of discussion. Does this book you recommend have an answer to this? Hello Alice, and thank you for your comments. Yes, your right, Jamila does mean beautiful in Arabic. I changed my name when I embraced Islam although my family who are Christians they call me by my birth name, I am happy to answer to both. Muslim women cover themselves for religious reasons and to be recognized as Muslims. Just as Mary (may God be pleased with her) Mother of Jesus (peace be upon him) covered so do Muslim women. It’s the same for Nuns they cover as a sign of modesty and separation from society, they want people to know they have a relationship with God. Please check out these two articles on Muslim women who wear the headscarf (hijab) and the covering of the face (Niqab). You will find that all religions are divided into sects whether they coexist in harmony is another matter. You will find Christianity, Judaism, Hinduism, and Buddhism each have diverse branches. So, in answer to your question, yes, The Complete Idiots Guide to Understanding Islam dedicates a whole chapter on the different sects. It covers the Sunni and Shia as well as other sects in the religion. I hope I have been able to shed some light on your queries. I’ve be curious to learn more about all religions and I’m currently research Islam. These look like great resources and I thank you for sharing them. Excellent and easy to understand take on Islam. I was thrilled to know that the word Islam means to surrender your will to God and acquire peace in your soul – I will definitely be taking that away with me. The word encompasses so much truth! Surrendering your will to God is only going to return peace!! The logic is perfect 🙂 . I found this to be very thought provoking and recommend anyone to have a read to help understand a religion that is marred in misconceptions. Thank you for your clarity and sharing your wisdom. Great review about Islamic beliefs and the Islam religion itself. I vey much like that criminals do get a harsher punishment in the Islam way of dealings with these types of people. This is why the crime rate is almost non-existent. My cousin turned to Islam from being a Lutheran earlier in his life. He has told me a little about the Muslims and how they follow the Islam religion, it seems very straight forward to me. Being as I am a women, I want to know more about the rights of Islamic women. I will be reading up on this. Thank you for all the information about Islam and the Muslims who follow the Islamic faith.